Another edition of mlb.com beat reporter Bill Ladson‘s inbox, dated 1/4/12. As always, I write my response before reading his, and sometimes edit questions for clarity. Q: How many wins do you expect the Nationals to have this year? Will a full season of pitchers Stephen Strasburg and Gio Gonzalez translate into a spot in the playoffs? A: Tough question; If you believe the statistical measurement Wins Above Replacement (WAR), then Mark Zuckerman made a very convincing argument that this team is already 11.7 wins better than 2011 without adding anyone else. However; even best laid plans don’t pan out. There are always regressions, injuries and setbacks that you can count on. So to say that the Nats will win 90 games is probably incredibly optimistic. However; if this team is really an 85 win team, then they’re going to be in the Wild Card race and may be buyers instead of sellers, and could get pushed over the top. I’ll say, right now pre Prince Fielder nonsense this is an 88 win team. Ladson says 85 wins but Fielder would turn them into a competitor for the NL East title. Q: How do you think the bullpen is shaping up? Will Se an Burnett stay or should we be looking for another lefty? Will Tyler Clippard earn closing opportunities in 2012? A: Our 2011 bullpen was the strength of the team and it comes back mostly in tact. We have yet to replace Todd Coffey, who was serviceable in 2011, but we look to be stronger in the “long man/spot starter” role. Kimball is hurt but Mattheus was pretty good in 2011. Burnett is signed through 2012 so he’s not going anywhere; do we need another lefty if we have both Gorzelanny and Detwiler projected in the bullpen? I’m sure either one could prepare on a rotating basis for a one-out role. Clippard is the set-up guy; he and Storen seem set in their roles and that’s great, since I think Clippard is a better pitcher and is getting the more high-leverage appearances. Not much to add from Ladson. Q: What is the situation with Rick Ankiel? Will he be coming back to the Nationals? A: Ankiel‘s not coming back; if the team wanted a plus defender who couldn’t hit, they can find him much cheaper. Kinda like Mike Cameron. Its too bad; he was so good in CF but so bad at the plate. Ladson thinks the team could still be interested in Ankiel as a 4th outfielder. Q: There is no doubt the Gonzalez deal helps the Nationals right now. But do you think they should have dealt their prospects for a center fielder? A: It seems like Mike Rizzo cashed in his prospects on a deal he couldn’t turn down, taking advantage of Billy Beane‘s firesale in Oakland to get a pretty good pitcher. Did he *need* another starter? Maybe, maybe not. Does he *need* a center fielder? Yeah he does. He also needs a lead-off hitter. And a better short-stop. But you can’t solve all your problems at once. I like Gonzalez; like what we got and think it was a good return on the prospects we gave up. I’m ok living with Werth for a year in CF and buying someone on the open market next off-season. Ladson agrees. Q: Are there any potential trade suitors for Jesus Flores? He shouldn’t be the Nationals’ backup catcher. A: Well, the second we traded Derek Norris, Flores became that much more important to this team. Yes he’s our backup, and yes we think he could start elsewhere, so perhaps at some point (if we feel confident that Ramos look strong) we can flip Flores and use Solano for backup purposes at the MLB level. But suddenly we may be looking at needing to develop more catcher depth. Ladson is right in saying that Flores is a project, and that we’d be selling low by trading him now considering his injury past. 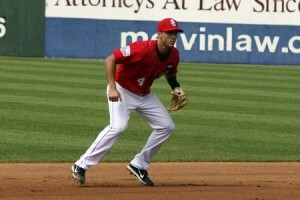 Q: With the bench still something of a question mark, will Stephen Lombardozzi be given a shot to crack the roster? If he plays well, what chance is there that he will start playing every day? A: I suppose; I wasn’t incredibly impressed with Lombardozzi‘s Sept 2011 call-up. I thought he looked beyond over-matched at the plate. I’d like to see if he could actually be a good middle infielder and not top-out as a Brian Bixler utility infielder. 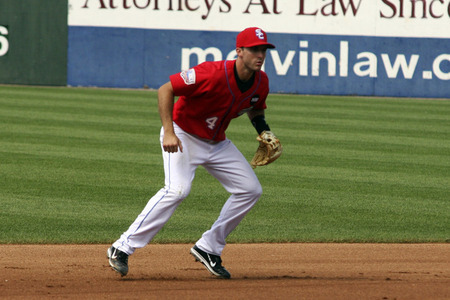 The team needs a 2nd utility infielder after DeRosa and Lombardozzi could fit the bill. Start? Hmm; Desmond isn’t going to be allowed to hit .220 forever, so yes its conceivable that at some point if Desmond doesn’t start hitting he’ll get replaced in the field, and it’d be great if the team had someone like Lombardozzi to step up. Ladson says its a long-shot. Q: Why is right-hander Yuniesky Maya still with the Nationals? A: Two words: guaranteed contract. Clearly he’s not the guy that the team thought he was; we have two more years for him to toil in AAA and serve as a spot starter/emergency backup. Its too bad; he has the arsenal and the moxie but not the stuff to survive. Ladson calls him a disappointment. Clearly. Subscribe to comments with RSS or TrackBack to 'Ladson’s inbox: 1/4/12 edition'. I don’t understand why the Nats are holding on to Bernadina instead of signing Ankiel. Neither one can hit left handers, but Ankiel is better against righties. Cameron can still hit lefties, so a Cameron/Ankiel platoon makes sense to me. About the center field situation: I’m inclined to thnk that Rizzo did extensive probing before, during and after the winter meetings to see if one of the young center fielders who have been discussed extensively (Upton, Bourjos, Gardner, maybe Span) were available at any reasonable price, and found that none of them were (indeed, none of them have been traded and there’s no indication any will be soon). Rizzo could have waited to see if that changed in spring training or early season, as sometimes happens, but Gio was definitely available and filled a need; better a bird in hand than two in the bush. Cost? Bernadina is pre-arb so he’s only gonna make $450k or so, but Ankiel made $1.5M last year. Both were more or less awful at the plate but at least Bernadina has skills that enable him to hit leadoff. Ankiel doesn’t. I dunno. I’m not a Bernadina fan either; he’s out of options and seems likely to get waived at the end of spring training. I’m guessing his last, last shot is to compete against Cameron and a couple other random players for a backup OF spot. I’d tend to agree. BJ Upton didn’t get non-tendered and now the Rays want something for him. Rizzo may just be biding his time til he can pounce in the FA market. Maybe the 2013 solution will be Harper in LF, Upton in CF, Werth back in RF where he belongs, Morse at 1B and perhaps we buy an upgrade for Desmond at SS. That’s a pretty good lineup. Re-sign/extend Zimmerman and then augment your rotation with another big name (Greinke?) replacing either Lannan or (more likely) Wang and that’s a pretty solid lineup. The Dark Horse candidate for a 2013 solution would have Espinosa at SS and Rendon at 2b instead of having to buy an upgrade. That’s if Rendon is on the Ryan Zimmerman path (callup in September his first year in the organization, grabbed a roster spot in year 2 and hasn’t let go). And that solution works whether Morse or Fielder is at 1b. I 100% agree with Sec 314 about the outfield. I would hope we’re past the point where the Nats keep Benadina instead of Ankiel because it saves $1 million. Bernadina would have been a good story if he had been a MLB hitter, but he’s in the Maxwell category. Ankiel is your perfect 4th outfielder, late inning defensive replacement. I agree with the “Dark Horse” option except for one thing … Rendon’s skipping the AFL has me a bit concerned about just how hurt he really is. This team really seems to be stuck on Desmond for some reason. He was just horrible at the plate .. but then again Espinosa wasn’t fantastic either (his power bumps up his OPS+ to near league average but he still hit .236 last year). If Rendon isn’t healthy, I don’t think he’s on a Zimmerman path. I hope we’re all wrong. I’ve kinda lost patience with Desmond, think Espinosa could easily slide to SS and rendon starts at 2b. That’d be an even better lineup frankly. Still no leadoff hitter though until we find someone that makes sense in the short term. Todd, couldn’t agree more with you on Desmond, don’t understand the attraction on the Nats part. Except that Davey Johnson doesn’t want defensive replacements on the bench he wants to have big bats. I do agree we will need someone who can play center field on the bench, but I wonder if Ankiel or Bernadina fit DJ’s idea.